GODDESS INTERRUPTED is really a book filled with action yet it is also a time of learning and growing up. Kate has won her place yet now she has to grow into it emotionally. There have been a lot of drastic changes in her life in the last year and she just isn't sure that she deserves the good things. There are points in the book where there is a bit too much angst for my liking however before it really gets over the top Ms. Carter introduces other things into the story line. 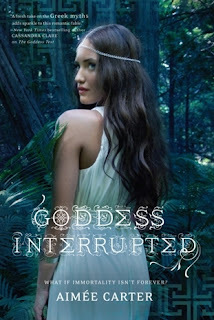 GODDESS INTERRUPTED is the second book in the Goddess Test series however you won't need to ready the first book to be able to enjoy this one. I feel that you might enjoy it more if read in series but it certainly isn't a requirement. I do recommend this book to young adult readers. Adults might enjoy it (I know that I did) also as long as they don't mind the drama that comes with growing up. ***I did receive this book from NetGalley for a limited time in exchange for the review. No money exchanged hands and all opinions are my own.